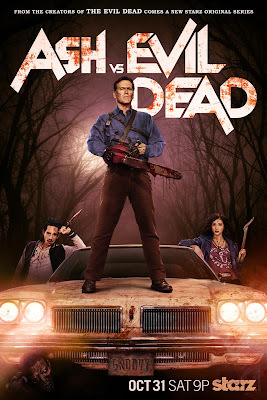 I didn't even love the Evil Dead franchise (its ridiculously fake 80s gore tactic was just silly to me), but I am geeked about the idea of an episodic series. I think it will give the writers more time to develop the scant premise into something far more substantial than a "haunted cabin in the woods" type story that has been done to death (literally). Plus, Jill Marie Jones (Girlfriends) and Lucy Lawless aka Xena, Warrior Princess team up with Bruce Campbell, the franchise's sole surviving actor?! Sold. If ASH VS. EVIL DEAD isn't kickass, I will be highly upset. (I realize movie-to-film adaptations don't exactly have a good track record, but I am still keeping hope alive). And watch the trailer here. Anyone else psyched? ASH VS. EVIL DEAD premieres Saturday, October 31, at 9:00pm ET/PT exclusively on STARZ with a 10-episode season.